I’m between gigs and have been spending most of my time digging in the dirt. 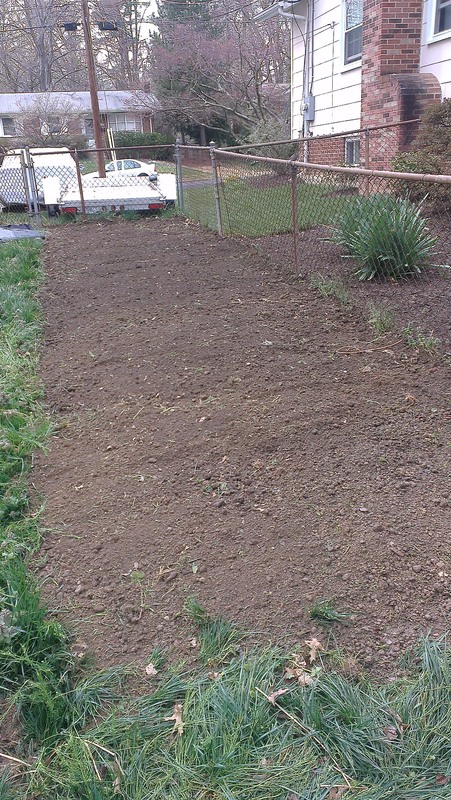 John tilled my veggie patch about two weeks ago; he did a fine job of it, too. Last year, due to my schedule, the garden went in too late, and the day John tilled it the soil was waterlogged after several weeks of rainy weather. It was a heavy, muddy mess that resisted raking and dried into great clods – not the most welcoming environment for tender seedlings. This year we got to it earlier; we hadn’t had rain for a week and the soil turned beautifully. I emptied the contents of my compost bin into it and John tilled that in as well, then raked everything smooth. The soil looked like crumbled chocolate cake, lovely and rich. Most years I don’t get the vegetable garden in until May, but the earlier prep gave me the opportunity to put in cooler-weather crops: lettuce, spinach and peas. In a burst of optimism, and encouraged by the wide variety of seedlings available at local garden centers, I also decided to try my hand at celery, carrots and radishes. These prefer an earlier start as well. I’ve mentioned in the past that I’m a lazy gardener, but what I really mean is that I hate weeding. So every year, once the soil is tilled and prepped, I cover the entire plot with water-permeable weed block. 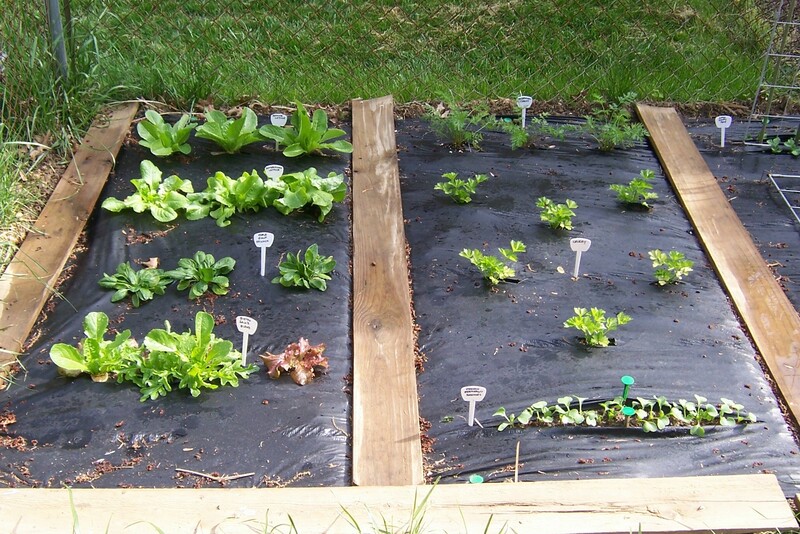 The stuff I use is a very thin plastic; determined weeds will eventually bore through it, but it’s a hard go for them. To plant seedlings, I cut an X into the fabric and dig the seedlings into the exposed earth; if I’m going to grow directly from seed, I’ll slash the fabric open and sow the seeds, then pin back the slash with pegs so the area gets sunlight. This is what I did with my radishes and peas. You can see this method in the photo at right. I’ve planted French Breakfast Radishes, which are more elongated that the typical round ones you see in grocery stores. I confess to being intrigued by the name. So – here is a photo of my first plantings, done about two weeks ago. 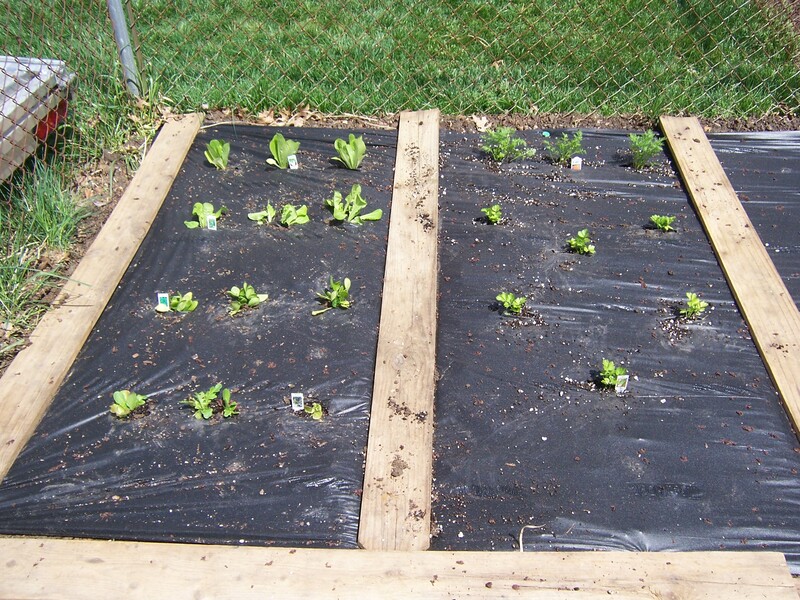 From back to front, in the first section, there’s three each of Romaine lettuce, Buttercrunch lettuce, Imperial Giant spinach and Bistro Salad blend. 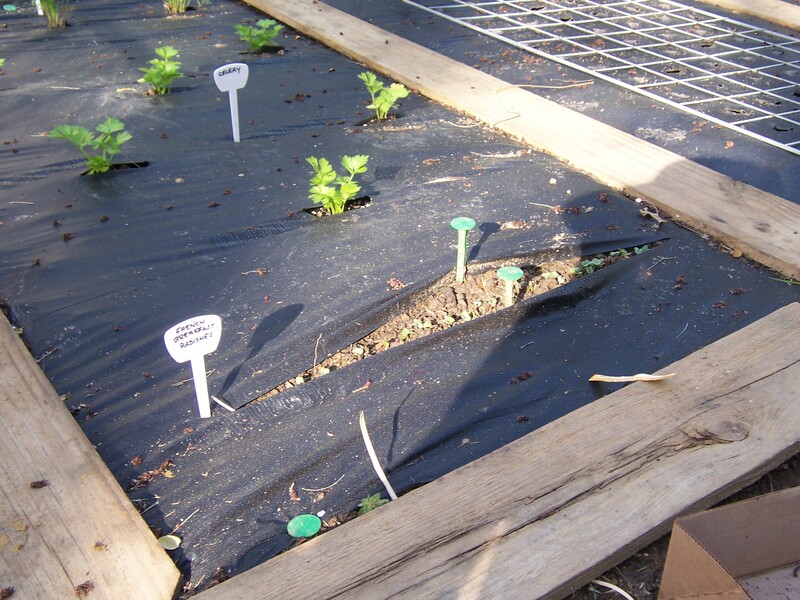 Second section is Tendersweet carrots at the rear, and celery ranging toward the front. When I took this photo, I hadn’t planted the radishes yet. And, for contrast, here is a photo I took today, just so you can see how the garden is doing thus far. We’ve only had one major rain and the weather went from oddly warm to more seasonal, so my worries about the tender greens bolting to seed have been allayed. The radishes have sprouted, been thinned and are coming along nicely. In the upper right-hand corner you can just see the end of my row of Super Snappy peas. They are also sprouting vigorously, and probably just need a few more days of sunshine before they really take off. As soon as I think I have enough lettuce for a good salad (without stripping the plants bare), I will start harvesting them. I confess to snacking on the odd leaf while working in the garden. Lettuce that’s just been harvested is so tender and its flavor so delicate that you don’t even need dressing. I think as a nation we do salad all wrong: serving it stone-cold and drowned in dressing. I’ll accept cold iceberg (it’s almost flavorless anyway, so it’s all about the crunch), but I prefer my salads at room temperature, and I keep the dressing to a minimum so it complements the greens instead of overwhelming them. Greens still warm from the garden are a special treat. I planted six rows of Tenderbush green beans (to the rear) and six rows of Goldrush yellow beans (to the fore). I did this about a week ago; it’s a little too soon for the beans to be germinating but I do check them every day to see if I have any sprout action. I’m feeling rather hopeful about this experiment. 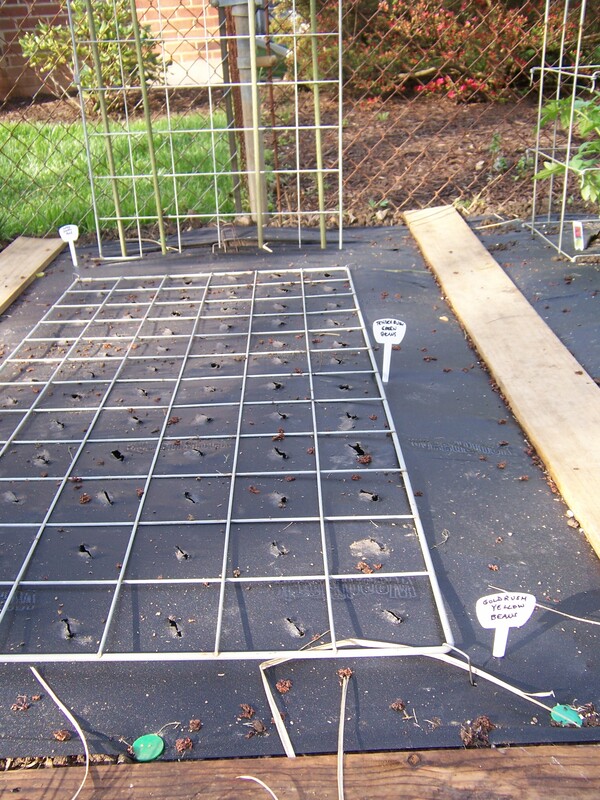 The upright grid behind the Bean Experiment is the support system for the Super Snappy peas. I also repurposed a cucumber trellis for this, so what, you may ask, am I using to support my cukes this year? The answer is: “A tomato cage, what else?” This is Grand Experiment #2. I usually have pretty good luck with my cukes, to the point of them nearly running rampant. The slanted cucumber trellises I’ve used in the past have worked fine, but they take up a lot of space. I wondered if a cuke might twine just as happily up a vertical support as it does up a support at a 45 degree (or more) angle. So I’m giving that a whirl this year. I argued with myself that the weight of the fruit might be too much for the vining plant and pull it down, but the cuke vines I’ve dealt with in the past have been pretty strong. So we’ll see. The final Grand Experiment is with a vegetable I’ve never grown before: the artichoke. I was visiting DePaul’s Urban Farm last week and darned if they didn’t have artichoke seedlings. I didn’t know anything about growing artichokes, but I quickly Googled the topic on my smart phone and found out that one can, indeed, grow them in USDA Hardiness Zone 6B (where I live). So I bought two Imperial Star plants and put them in the very end of the garden. Apparently if the plants do well they spread a good bit, so that will give them room to do their thing – and if they don’t thrive, I can pull them out without leaving a gaping hole in the middle of the patch. I plant tomatoes every year, but I like to try different varieties. This year I planted a Beefmaster, a Lemon Boy, a Brandywine, a Sweet 100 and something called an Old Johnson, in addition to my usual three Romas (to make tomato sauce). I put in three kinds of pepper: Jalapeno, Orange Blaze and something called Sweet Heat. I also planted a single Limelight zucchini. John won’t eat peppers or squash, so knowing that I will have full responsibility for eating them makes me curb my natural urge to overdo it (I’m still eating pickled okra from the year I put in too many of those plants – John doesn’t like okra, either). The remaining space in the veggie patch went to basil and Italian parsley. I indulged myself in a few strawberry plants and potted them up, as well as three varieties of mint. I won’t put them in the ground because they’ll take over. They’re living on the Bunny Bench on my deck, along with a Sweet Annie. This is a plant that I bought simply because it smells so nice. 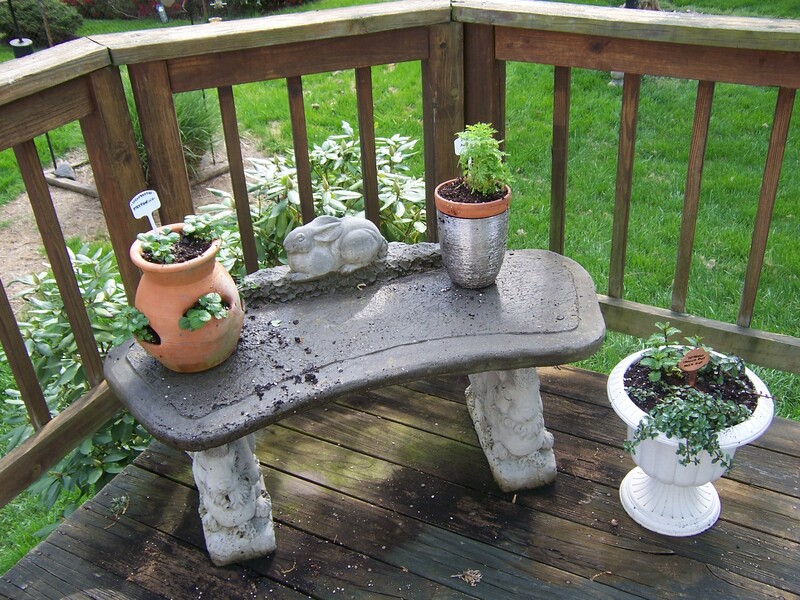 My herb garden was neglected last year (along with my ornamental garden, which will be the subject of my next post). My big rosemary bush died and only my chives, tarragon and sage wintered over, so I pulled the rosemary out (a fragrant job) and put in a couple of new plants. I also planted dill, cilantro, marjoram, eucalyptus and stevia (!). Yes, you can now grow your own no-calorie sweetener. All I lack now is a lemon verbena, but I haven’t found any in the garden shops yet. So that’s the edible part of my spring gardening, and I’m glad that I was able to get everything finished early. I start work on a week-long gig at the Kennedy Center tomorrow, which will limit my gardening time. I have a week between that gig and my next one, and that free week will happily coincide with the delivery of an early birthday gift from my mother: plants for my flower garden. That bed was such a disaster that John and I pulled almost everything out of it and will be starting afresh. I am eagerly awaiting my gift of hollyhocks, coneflowers, Shasta daisies, red Penstamon, balloon flowers and Snow Queen hydrangea, and am looking forward to creating a beautiful new garden out of two years of neglect.